Without adequate financing, the best intentions of the global community expressed in the Sustainable Development Goals will remain beyond reach. Noting that the global economy continues to grow, but at a slower pace, the world’s economic and finance chiefs vowed to continue to mitigate risks, enhance resilience, and, if necessary, act promptly to shore up growth for the benefit of all. Read the communiqué of the International Monetary and Financial Committee. 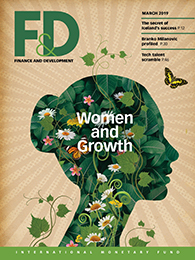 Gender in finance has macroeconomic, moral and ethical implications extending across national borders, cultural chasms, and class divides. It affects women all over the world—from executives in boardrooms to women who seek education, access to financial services, and employment opportunities. Read speech by David Lipton. At the opening press conference of the IMF-World Bank Spring Meetings, IMF Managing Director Christine Lagarde called on countries to work together to address this delicate moment for the global economy. Read transcript of the press conference and watch the video. The Spring Meetings took place in Washington, D.C. from April 8-12, 2019. Access all the documents and videos on the Spring Meetings site. We welcome your ideas on future evaluations and comments on our past and ongoing work. The IMF's staff of highly qualified professionals are dedicated to the goals of the institution to promote global economic growth and stability, and raise living standards and employment.